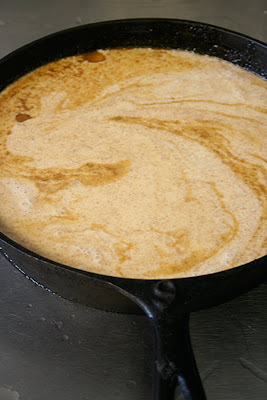 Caramelized Pear Ice Cream Batter done in the cast iron skillet my mama gave me. I know it can be annoying for all of you weekday cafe regulars to happen upon the "Brunch Menu" on the weekend. So often you scan this weekend-only menu for your regular weekday order, only to find the item altered, or missing all together. My only explanation for this occurrence is this: Evan and I see our weekends as our free pass, or better yet, our creative outlet. Frankly, having the same menu day-in and day-out is a little boring to us. We look forward to the weekends and see them as our opportunity to spice things up, or to pursue a recent inspiration, and when it comes down to it, the weekends are the only time we have the wo/man power to execute these ambitions. As a compromise, I'm relying on this blog post to inform you of a few of the new items you can expect to appear on this weekend's Brunch Menu. Granted I'm not posting this until late Friday night but the fact of the matter is that it's currently 9:32 pm and I just ate my dinner out of a box (T. Joe's Organic Mac'n'Cheese) and Evan is still at the cafe assembling a kitchen cart from IKEA. Forgive us. Believe me, we're doing our best. And due to the number of overwhelming requests, yes, we will have Pain Au Chocolat Bread Pudding with Candied Orange. You can thank my mother for this. I have nothing to do with it, unless you consider me calling and harassing her about it proactive. Oh yeah, and if the picture above didn't already indicate, we've got Caramelized Pear Ice Cream for the weekend. Get your milkshake orders in while it lasts. I'll make the whipped cream. R & R & Beer Bongs?